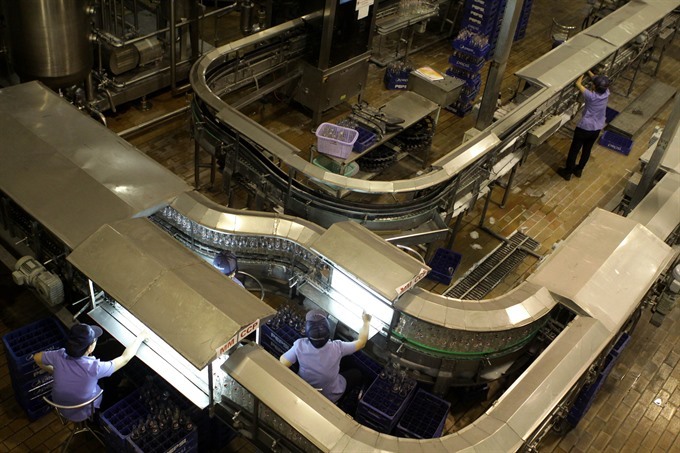 A bottled water production line at a factory of Suntory PepsiCo Vietnam Beverage Co., Ltd in Cần Thơ City’s Trà Nóc 2 Industrial Zone. CẦN THƠ – A Cần Thơ leader has said the city should co-ordinate with relevant ministries and other agencies to draw up economic plans, using all available resources and improving incomes and the city’s economic vitality and quality of life. Trương Quang Hoài Nam, deputy chairman of the city People’s Committee, was addressing the 2017 Annual Economic Forum on Wednesday, which was attended by nearly 100 economists and experts. Through the meeting, the city government seeks advice from experts on planning, the environment, land issues, taxation, and administrative reform. Huỳnh Văn Tùng, deputy director of the Cần Thơ Institute for Socio-Economic Development Studies, said Cần Thơ’s economy has grown by an average of nearly 14 per cent a year in the past decade. The city’s average income is estimated at nearly VNĐ65 million (US$2,850), exports this year are expected to be $1.28 billion and retail sales of goods and services are forecast to be VNĐ16 trillion ($701 million). Around 60,000 jobs are expected to be created. But Tùng said the economy faces major challenges. Many of the targets set under a resolution adopted by the city People’s Council have not been achieved, economic growth is not as high as expected and falls short of the city’s potential and status as a centrally run city and the heart of the Mekong River Delta region. Assoc Prof Dr Võ Thành Danh of the economics faculty at Cần Thơ University said the financial and human resources available are inadequate for the city’s economic growth. Moreover, restructuring of the workforce has not been thorough in sectors with high labour productivity, he said. He also pointed to a failure to take full advantage of the city’s tourism potential, especially in utilising the capacity of its airport. Nam thanked the experts for their inputs and promised that the administration would review and speed up the allocation of funds for projects and for public spending. It would focus on assisting businesses, especially the industrial sector, based on the Government’s Resolution 02/NQ-CP, through a number of measures that would mitigate the difficulties faced by businesses and foster the markets, he said. The measures would include focusing all possible resources on developing infrastructure and improving vocational training, strengthening communication campaigns to raise awareness of the ASEAN Economic Community among public servants, businesses and the public, bolstering trade promotion at home and abroad, tapping all available opportunities to develop exports, encouraging the agricultural, forestry and fisheries processing sectors and improving the quality and value of agricultural, forest and aquatic produce. The city is also striving to adopt new production technologies and foster exports of new products with high value-addition, including in the footwear, garment and textile and handicrafts sectors. It will also focus on administrative reform to attract investments, considered a vital factor in increasing production and exports. To support the development of small- and medium-sized enterprises, the city will establish a zero-interest credit guarantee fund for small businesses and start-ups, guide investment promotion activities and issue a list of projects requiring investment, including foreign. Tourism businesses will work closely together to launch trips to various cities and provinces nation-wide.